The AOPEN Chromebox Commercial is a highly reliable and powerful device that operates 24/7 under tough conditions (up to 60ºC/140ºF*). 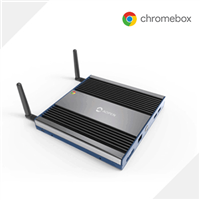 It sets itself apart from any Chromebox, being a commercial grade device, allowing speedy and secure signage from the cloud using Google Chrome OS.Deployment and management of the devices have never been easier using Chrome Device Management. Use the signage app of your preference available via the Chrome Web Store to control what’s on the screen. The tough design including the industrial components makes this one of the strongest Chromebox devices available on the market today.